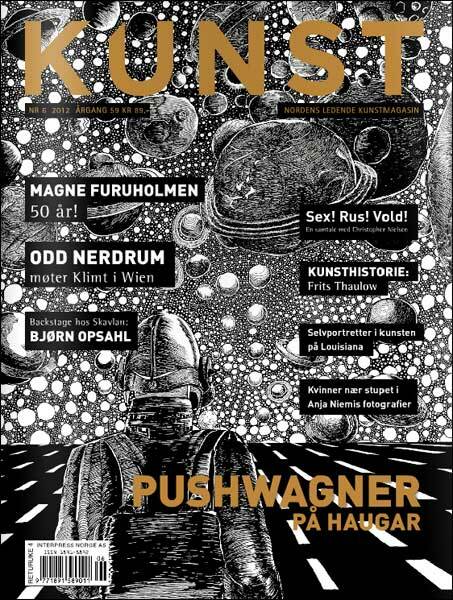 In December, KUNST published a long interview with Magne in connection with ‘Bouquet’ and his 50th birthday. The interview can be read in Norwegian online here, and the folks at Fineart.no are willing to send out back issues upon request. Below is a translation of the article by Tiffany Dahlgren. The last time that I met Magne Furuholmen, he was into aluminum and card houses. Now he has wrapped up the so called Aalto building in the center of Asker with anagrams. What is Magne Furuholmen’s artistry all about really? Four men in mirror mosaic suits, antlers on their heads and gas masks, who make music they don’t like and go by the artist name Apparatjik. A sail for Kjell Inge Rokke’s (Norwegian millionnaire) boat. A sealed sculpture with thoughts from teenagers in 2012, addressed to the future. Clay jars as tall as a man with English words mixed up like letters in Alphabet Soup. Letters and forms painted on bloody sheets from surgery and emergency rooms at the Riks Hospital. A card house made out of recycled aluminum in front of the Peace Center and a room clothed with protective aluminum foil over snow and ice with the titles CLIMAX and ANTICLIMAX. Pictures of letters and fragmented texts. Doll versions of Magne Furuholmen, portraits of him as others see him or want to see him, in a room with Furuholmen’s voice on hundreds of soundtracks in the installation “MANGE (“Many”) Furuholmens Discussing Art With Himselves”. And the more well-known projects: TV2 channel’s show “The Voice”, a job as manager and a life as a recording artist with 2 solo albums and a pop career in a-ha. How can someone describe Furuholmen’s landscape? Let’s just go right back to the beginning: a vulnerable line picture and a lead suitcase filled with memories. Magne Furuholmen has allowed KUNST magazine to enter the most holy: the studio at the old Trafo station in Asker. A model of Kjell Inge Rokke’s sail catches the eye: CODE ONE. The photographer gets some rules. Around us, everyting is ready and packed for Furuholmen’s big jubilee exhibit that opens November 3 in the rooms under us in connection with his 50th birthday, November 1. Here is his artist life in boxes and drawers, from his debut project and graphic folder with 10 pictures, “VULNERABILITY” in 1994 to his latest exhibit “ECHO” with paintings on bloody sheets in 2011 at the gallery Stolper + Friends, where he is co-owner. It’s been a long time ago since I hung up a-ha posters over my bed and Barbie house, and danced to “Take on Me” under the discolights at the disco every Thursday. Somewhere on the road from leather wristbands to a Moods of Norway jacket, Furuholmen changed from a commercial popstar to an artist who sets his own rules. He shows us a picture of a vulnerable line that almost seems to vibrate. He darts around the boxes and a decorated ceramic vase full of cigarette butts. Nearby, Furuholmen’s porcelain dish set “Love Hearts” with simple, handpainted statements that appear as the food is eaten. A card house is still keeping its balance high up on a shelf. Tools lay in order according to size on the countertop. There is organization in the chaos. We hop on over to a new part of Magne’s life. The woodcuts, that give associations to music compositions, were printed in brave color combinations and bold colors in “ERASING MEMORY”. In 1995, Furuholmen received the “Autumn Exhibit Award” for the wood cut “TRAVELER” and the same year he made “FLAG for BURMA”. The following year, his portfolio “EVERYTHING HAPPENS TO ME” came out: 5 woodcuts, a poem written by Henning Kramer Dahl and 4 CD’s with music by the jazz legend Chet Baker. The pictures were made while Furuholmen constantly played Chet Baker in order to see if music could be carried over or transformed into graphic art. Two years later, came “BLUE NOTE BOULEVARD”, an artist book with original wood cuts. The book was kind of a journey through jazz history from 1939-1969. Magne tells us that he quickly got the label “colorist” with these pictures, something that triggered his next project: “PAYNE’S GRAY” in 2004. In “PAYNE’S GRAY”, Furuholmen tore down the dividing wall between his visual art and music career. He experimented with that blue-gray color in all its colors and hues and tones, a color that many believe was discovered by the 1800’s painter William Payne. And he used his own texts running in spirals with fragmented text and as single letters. In 2005 “RUINS” came out, as a follow-up to this graphic painting series. And again, Furuholmen changed expression; from gray to earth tones in the series “MONOLOGUES”. As a kind of final conclusion to the “PAYNE’S GRAY” project as a “cemetery for purpose” but also as a start of something new. In the vinyls, he cut up all the vocal files from a-ha’s album “Foot of the Mountain” to single words and organized them alphabetically and made new sentences. Since the early 1990’s, Magne has experimented with glass and clay. The jars, with his own designed shape, have also become a part of his signature trademark. He shows us one of them with the letters both etched in like handwriting and also printed into the clay with forms. Such a thought process fits Magne. He seldom stands in the same place for more that a minute and he is always moving the whole time around and between vases and boxes. We follow after him. 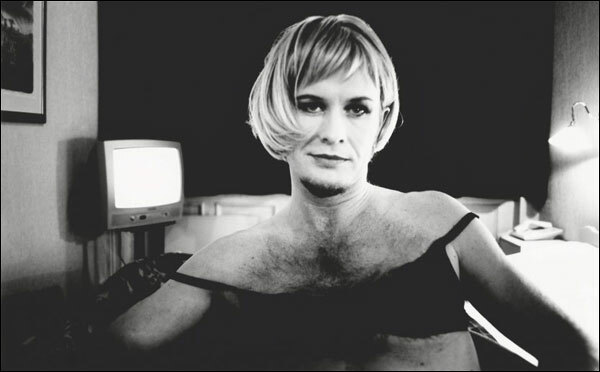 Magne–“To others, it might seem that I spread myself too thin as an artist, but *I* don’t think I do! I see the entirety, the whole, better from many angles. I learn by moving and seeing different perspectives…also in projects. But of course I respect artists who focus on 1 thing their whole life, Like Jan Groth for example. He stops in front of the last paintings on bloody sheets that he has painted with the color “sanguine”, which is latin for “blood red”. Each painting measures 85×200 centimeters, the measurements of a standard hospital bed. The painting series has gotten the title “ECHO” and “FUTURA PLUS” and refers to the life within hospitals, but also to the drama that has played out on these sheets. He goes over to some long, metal plates with the words “Do Not Forget”. Recently he was doing the project “TIME CAPSULE” in light of what happened July 22 (the Oslo terrorist bombings/shootings). In 2031, his sculpture that contains thoughts from teenagers in 20 high schools will be opened. The letters are stored in metal boxes and sealed inside Furuholmen’s sculpture in the foyer of the Riks Archives. Suddenly he crosses the floor again and goes over to a lead box case. And again, we quickly go from the end to the beginning. The box case is the work “TRAVELLER”, from 1989, the work that never ended. He lifts off the very heavy lid and shows us the contents: old photos from his father’s accident. Documents. Magne finds a catalog and shows pictures of Apparatjik in mirror mosaic suits, antlers and gas masks at the New National Gallery in Berlin. Here there is humor, dada and electric cars made into a disco mirror ball. He then lets us take a photo of him in front of the letter covered building. Magne–“Before I start working, I make some driving rules. In this project, I chose to only use letters in the words “KUNST RETT VEST” (Art right west) The color palette I limited to the colors of Dutch tulip flowers. Such rules and laws can seem liberating. Says Magne Furuholmen. From a little detail the most complex projects spring out. And a simple, vulnerable line is the sprout of big card houses and wrapped up buildings. (pg. 12) KUTT was one of Furuholmen’s first wood cut series with titles from his father’s jazz notes. His father died in a plane crash in 1969.
cycle from birth to death. between art and pop culture. impression of ships passing by. made from recycled aluminum and shows a house about to collapse. From 2004, marks the transition from colors to a narrow, limited palette with Furuholmen’s own text. value of the picture. The picture also contained instructions on how you could get the kroner bills loose off the canvas.